Here is a recipe that is special to me: it was one of my favourites when I was a child. 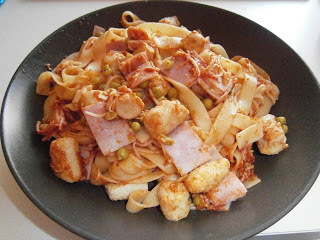 What's great about pasta, is that you always find something new and nice to do with them! Cook the pasta. Cut the quenelles in 2 and the ham in dices. Heat the tomato sauce, add the herbs, salt and pepper. Add the quenelles, the peas and the ham. Mix well and add the pasta and the grated cheese (or you can serve the tagliatelle in the plates and cover with the mixture and the cheese). What is usually done with the quenelles is using the half of the tin and freeze the rest. But I love that, so I decided to put the all tin in the dish!! !